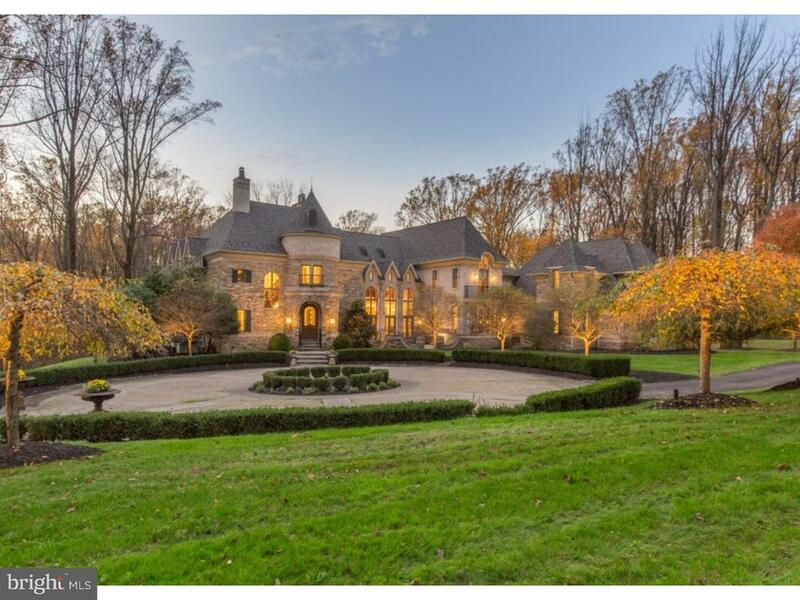 All Huntingdon Valley homes currently listed for sale in Huntingdon Valley as of 04/21/2019 are shown below. You can change the search criteria at any time by pressing the 'Change Search' button below. If you have any questions or you would like more information about any Huntingdon Valley homes for sale or other Huntingdon Valley real estate, please contact us and one of our knowledgeable Huntingdon Valley REALTORS® would be pleased to assist you. "Welcome to this Spectacular Custom Built French Normandy Home in secluded location.This home was meticulously built by a local luxury home builder as his personal residence.No detail or expense was spared in building this beautiful One of a Kind Home.There is approx 14,000 SF of luxury living on 3 levels overlooking 5 acres of bucolic grounds backing to over 800 acres of preserved ground with the Pennypack Trust.Enter this magnificent home through the arched mahogany door into the grand central entry hall featuring limestone flooring,coffered ceiling & amazing high end lighting fixtures.The formal living room is situated on left side of entry hall & features a gas F/P French doors to a flagstone terrace overlooking the grounds.The formal dining room is on the right side of entry hall & features a double sided gas F/P which also faces the entry hall.Prepare to be amazed as you enter the thoughtfully designed kitchen featuring custom wood cabinetry,Brazilian cherry hardwood floors,6 burner Viking gas range w/double ovens,Subzero refrigeration,large island with seating & marble counters.Kitchen also features a breakfast room with verdant views of the rear grounds,a hearth room with gas F/P & butler's pantry with wine fridge.The 2 Story Great room features a floor to ceiling stone gas F/P,Brazilian cherry wood flooring & wall of glass windows offering magnificent views of the rear grounds. The main level also features a den/office with built-ins,main staircase from the entry hall & 3 level open staircase serving the upper&lower levels.Upper level features a huge master suite with sitting room,bedroom with gas F/P,4 walk in closets,master bath with soaking tub,large stall shower & double sinks.There is also french doors to a private terrace for morning coffee or evening relaxation.There are 3 additional bedrooms with en suites & walk in closets.The laundry room is conveniently located on this level.Follow the open staircase to the lower level and you will find an extens"
"Amazing opportunity to live in a tranquil setting with resort-style amenities! Feel like you're on vacation every day of the year at this stunning estate. Enjoy lush grounds with a gorgeous pool complex with blue flagstone, a cabana complete with an outdoor kitchen that includes a wet bar, grill, large screen TV, a fireplace and a full bathroom. Fitness and sports enthusiasts can enjoy a plethora of activities in two remarkable fitness facilities. Enjoy daily workouts in the 2-story fitness center complete with a full bathroom and a deck. Also enjoy the extraordinary indoor sports arena that provides for endless activities with a full size indoor basketball court/tennis court. This temperature controlled facility can also be used as a wonderful event space and it is also perfect for car collectors and more! This stunning home offers the best of both worlds with the perfect blend of old world charm and modern day design elements. The handsome circa 1914 stone facade and covered front porch welcome you to 2205 Washington Ln. Upon entering the grand foyer you are immediately drawn to the dramatic 2-story spaces with 'glass walls' that provide abundance of natural light and majestic views of the lush grounds. The magnificent 3-sided, floor-to-ceiling stone fireplace can be enjoyed from various rooms and creates a wonderful ambiance. The main floor boasts various spacious rooms for entertaining that include a full wet bar, formal dining and living rooms with beautiful fireplaces with mercer tile inlay. The gourmet, island kitchen includes stainless steel appliances, a 6-burner gas range with hood vent, a walk-in pantry and an expansive breakfast room. The lower level offers a home theater/media room with stadium seating and additional entertaining and living space including guest quarters and a full bathroom. 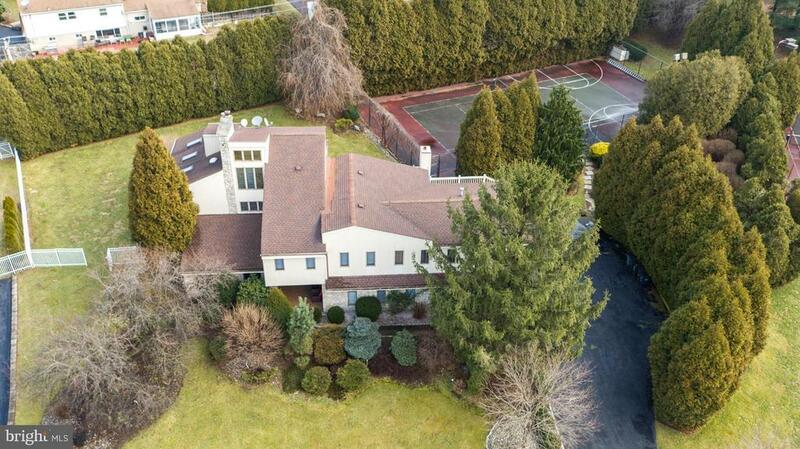 The second level of the home includes the master bedroom suite with sitting room, walk-in closet and expansive master bathroom with a large seamless glass sh"
"A beautifully designed 6700 sf Italian Villa located in the heart of Huntingdon Valley. This elegant and stately home features 4/5 bedroom, 4 full baths and 2 half baths and is situated on 1.3 acres. It is a labor of love for the owner who spent his career building homes. The front features views of Huntingdon Valley Country Club, a gated entrance leads to a cobblestone courtyard featuring four balconies with custom wrought iron railing and four garages with an in-law/guest suite above. Equally impressive is the back yard featuring a 2,000sf Brazilian slate rear terrace with koi pond, outdoor cooking, multiple seating areas and impeccably maintained gardens. Inside this home, the details are endless. An additional lot directly behind house for sale with home. Make your appointment today." "Rare, Classic, Totally CUSTOM ESTATE HOME that offers unparalleled design, meticulous craftsmanship & a stately elegance that is truly exceptional! The moment you enter you will realize that the finest in quality workmanship surround you. Combination of elegant design, exceptional architecture & remarkable details are found throughout. 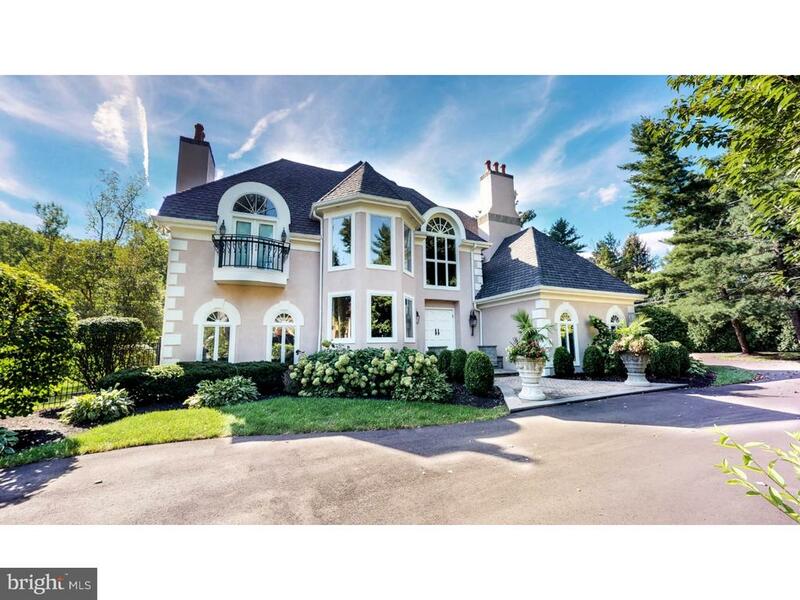 This home is one of the most magnificent homes ever to become available in Huntingdon Valley. Elevated 1.6-acre double lot w/mature trees, pristinely manicured landscaping & graceful gardens on a cul-de-sac is the perfect setting for this SOLID Brick Masterpiece. Entering the elegant Foyer, you are welcomed w/ dual staircase that is a breathtaking focal point. A design that will be hard to forget! Grand foyer is flanked by graceful Living/Dining Rms. Living Rm w/ f/p, exquisite custom bookcases, intricate details & stunning grand piano alcove surrounded w/windows. Beautiful Dining Room w/gas f/p, & corner curio cabinet will showcase treasures. Elegant setting as you dine with family & friends. Spacious lst floor Guest Room w/ full bath is tucked into the rear area of the foyer. Family Rm has wood burning f/p-Beautiful windows bring the outdoors in & create a warm ,welcoming living area all year round. Expansive Kitchen is a true Chef's Delight! Abundance of classic white cabinetry, large island w/ seating & work space. Dishwashers & sinks, wine cooler,full sized ref w/ ice maker line & full size freezer make this kitchen a special place to begin and end the day! Custom wine center w/ classic French doors completes this area perfectly. This Heart of the Home has been designed to enjoy everyday family life & an inviting place to entertain. Views of the picture-perfect grounds & also access the custom paver patio from the adjoining Breakfast Room. Powder Rm & rear staircase located off this area. Adjoining the Kitchen is an amazing Great Room- Custom designed to welcome large gatherings or enjoy private media seating area with a few "
"Welcome to this gorgeous, Custom Built Estate Home nestled in the Heart of Huntingdon Valley. This home was built in 2013 with nothing to spare! This 5 Bedroom/5.1 Bath Home with First Floor Master Suite is Sited on 3.07 Acres behind a gated entrance. As the gates open, pull into the Circular Driveway and you will immediately be greeted by a beautiful Three Tiered Fountain. Enter through a Soaring Two Story foyer with elegant chandelier and gleaming hardwood flooring. To your right is the Formal Dining room featuring Arched Entrance, tray ceiling and Exquisite Moldings with lots of natural light where you will be proud to entertain your family and friends at anytime. Please note, there are exquisite moldings/woodworking through this home. Directly across from the dining room is the Well-Appointed formal living room/sitting room framed with Columns where you can easily relax & converse in a more formal setting. Continue to the inviting Great Room with soaring ceiling, featuring shadow box molding, gorgeous wood flooring and cozy gas fireplace - a great gathering space to enjoy anytime. The Spectacular Kitchen features granite, beautiful custom cabinetry, stainless steel appliances and gas cooking. You will have your choice of enjoying less formal meals at the Center Island or in the adjoining Spacious Breakfast Room that opens to the extensive Tiled Sun Room through sliding glass doors, leading to the deck where you will enjoy peaceful views of your back garden and adjoining natural space. The chef of the home will enjoy the convenience of a butler's kitchen, equipped with everything you need for food preparation. This home features a spacious FIRST FLOOR MASTER SUITE with sitting area, two sets of walk-in closets, tray ceiling, ceiling fan with adjoining en-suite bath highlighted by double vanity, jetted tub and vented shower enclosure ~ your own oasis! Before heading upstairs let~s not forget the large mud room, concealed laundry and entrance to the three"
"Rarely offered, must see, Inverness stone and stucco Colonial home, with over 6500 square feet of living space, featuring 5 bedrooms, 6 full and 2 half baths. This stately, former sample home is situated on a premiere lot in the desired neighborhood of Inverness. The floor plan has a gracious flow for everyday living and entertaining. The home features a grand foyer with turned staircase, second staircase, gourmet kitchen featuring granite counter-tops, double ovens, two dishwashers, high ceilings, top of the line professional appliances, separate breakfast area and counter. Great room has a stone gas fireplace and built in custom wall unit and has a bonus entertainment area with attached bar, carved wooden pillars and decorative stained glass archway. The first floor also boasts a formal living room, with gas fireplace, spacious dining room with tray ceiling, library/home office with custom wooden book cases and fireplace and screened in porch. The first floor also offers separate in law, guest or nanny suite with a spacious bedroom with handicap accessible full bath, walk in closet and separate HVAC system. The upper level has 4 bedrooms, each with its own full bath. The master suite includes a spacious sitting room, a dream master closet and a bathroom featuring a custom spa bath, large shower, and his and her separate vanities and toilet/bidet. The upper level is complete with a full laundry room, open desk area with custom cabinetry and walk-up finished attic. The finished lower level has a game room, gym, exercise/aerobics/nanny or guest room, full bath, and full HD cinema with built in surround sound great for TV, or enjoying a movie or sporting event. The private backyard features a flagstone patio. There is a 3 car attached garage. 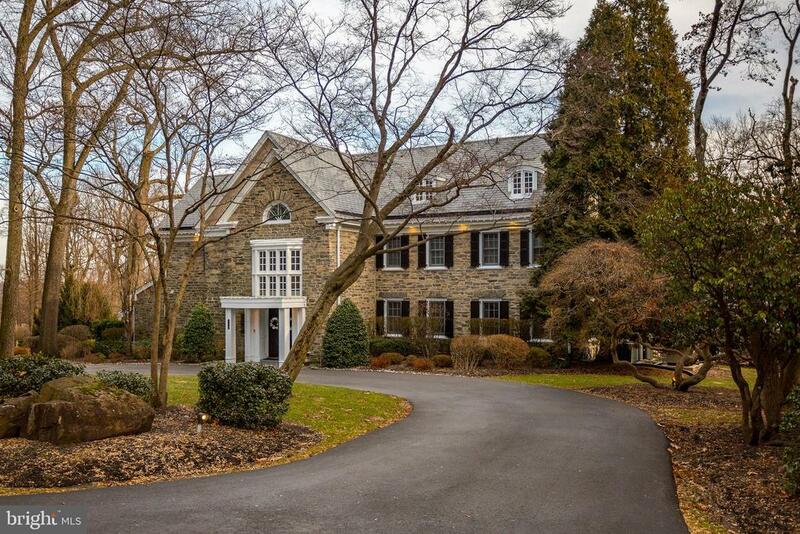 This wonderful home is in the award winning, Lower Moreland School District. Real estate taxes are in the process of being appealed." 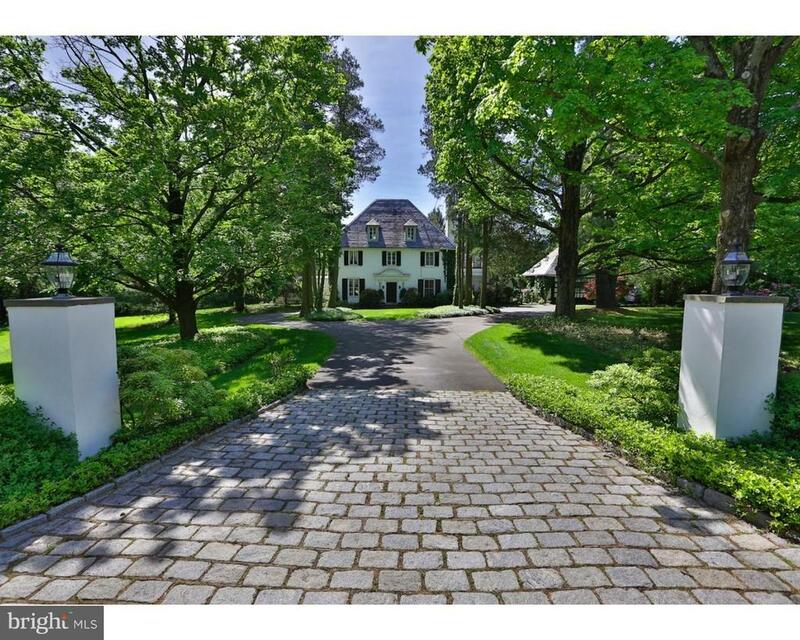 "Absolutely Stunning estate in sought after Lower Moreland School District. European style gas front door lanterns surround center main entrance area, large custom tiled foyer, leads to dramatic wrap around stairway. Dining room features a dual tray ceiling, living room features a large mantle and gas fireplace. Open floorplan kitchen with large island and expansive seating area leads to a large two story Greatroom with wood beam ceilings and custom wood/granite fireplace. Master Bedroom suite has tray ceiling is accompanied by an entrance/sitting area and customized walk-in closet and is complimented with a large master bath featuring a onyx stone floor with separate water closet and walk-in rain shower. Three additional bedrooms are complimented with a large hall featuring dual study areas. Custom tiered outdoor entertaining area features an upper 30x20 travertine stone patio, a custom stone pool with a travertine stone patio area and has a waterfall and large attached hot tub ? full pool automation with chlorine generator. This home is a must see!!" 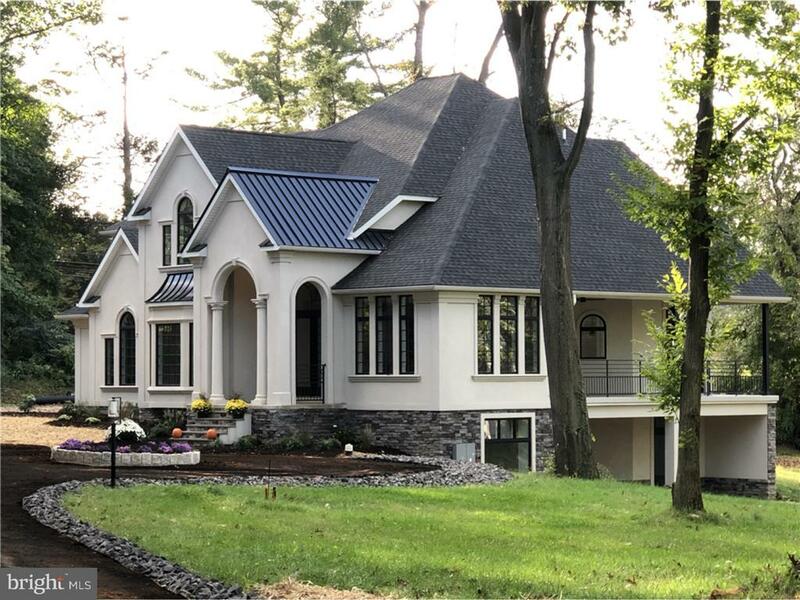 "Proudly presenting this absolutely stunning, luxury, one-of-a-kind custom design/built home in one of the most convenient and serene locations in Huntingdon Valley! (and please watch our state-of-the-art Virtual Tour since words simply do not do this property justice!) The story of this home is evident by the lovingly designed architectural details, quality of craftsmanship, and property grandeur - every place you look! 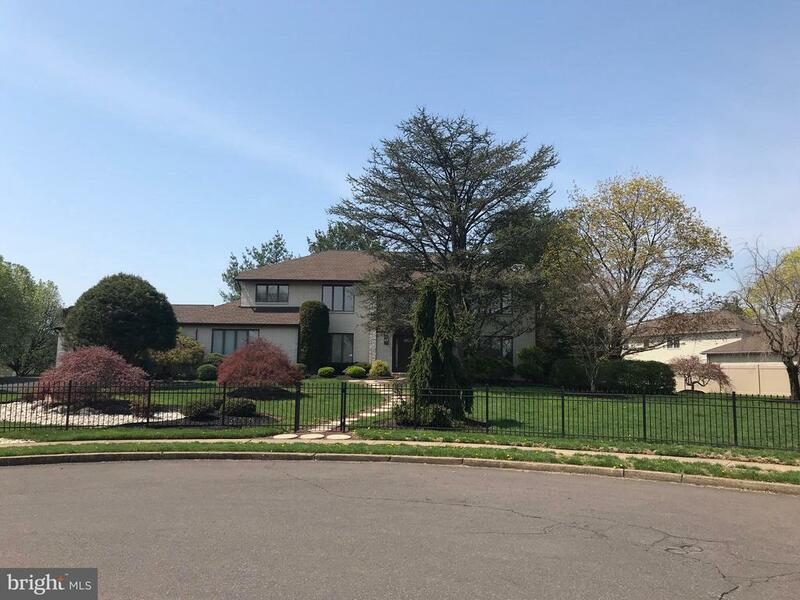 This massive manicured-maintained property has 7,770 livable sqft, and sits on a lot of 1.29 acres with two car garages, and plenty of driveway parking. The property features: 1st floor ? spacious & elegant 2+ floor height foyer, large sitting area, official dining room with a beautiful fireplace, living room with stunning fireplace, 2 family rooms, powder room, huge kitchen with stunning sunlit octagonal breakfast room, kitchen pantry room, separate main floor in-law suite (or au-pair suite), and a stylish wet bar. 2nd floor ? master bedroom and 4 other over-sized bedrooms, spa-like master bathroom and 2 more bathrooms, 3 walk-in closets and other standard closets, 2 private balconies. 3rd floor ? huge open floor room that can be easily converted to another spacious suite/game room/media room etc. Basement ? huge unfinished basement with high ceilings, waiting for your final personal touch! Other important things you should know: State-of-the-art, multi-zone, high-efficiency, heating and cooling systems installed with 1 remaining year of warranty. The roof has a lifetime warranty. 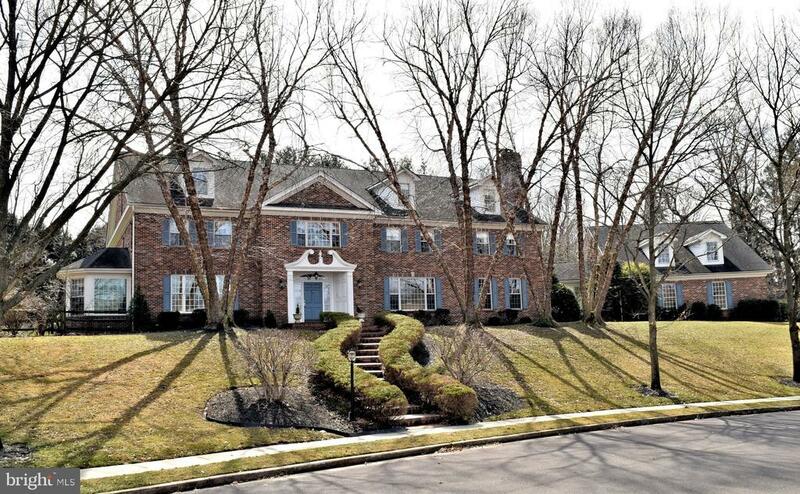 The property is assigned to the Top-rated Lower Moreland School District. High-end outdoor Jacuzzi and very large back, side and front yards! Just minutes away from upscale restaurants, shopping and so much more. This property has all of the right attributes to ensure your comfort, style, and enjoyment of this one-of-a-kind home, so don't wait and contact the listing agent TODAY for a private showing!" "Privacy and easy-care, park-like grounds with a pond surround this dramatic, luxurious converted bank barn, fully updated in 2008 to provide one-floor living for those who desire it. Step into the great room and be prepared for awe-inspiring views of the grounds at the treetop level. It's magnificent. This main living space is two stories high with original beams, a stone woodburning fireplace, wood floors, built-ins and enough space for several seating areas, though truly, everyone will want a seat with a view. French doors open to a formal dining room where once again, a wall of windows frames those enchanting views. Behind the dining room is a big custom Living Quarters country kitchen with cabinetry topped in granite, a wall of pantry storage, a wet bar with copper undermount sink and faucet and icemaker. Stained and leaded glass windows behind the sink provide pretty light. A first-floor laundry room provides roomy, convenient utility space. Just beyond is a heated three-car garage. A custom door opens to a sun-filled kitchen garden and terrace. Above this area is a large finished room with broad arched windows, perfect as an office, game room, exercise area, etc. A loft area over the great room is ideal for an artist's studio or office. The first-floor main bedroom wing has its own large sitting room with a corner gas fireplace, vaulted ceiling finished in wood and arched picture windows, plus access to a large deck. The sleeping quarters are airy and expansive with a tray ceiling trimmed with cove lighting and substantial moldings. A door opens to a private balcony. Two walk-in closets ensure ample storage. Like so much of this home's living space, the sumptuous main bath was designed to bring in the view with a soaking tub placed below a corner bank of windows and a medicine cabinet that descends via a lift into the cabinet base so as not to block the view. An over sized glass-enclosed shower and radiant-heated travertine floor complete this space. Almost a"
"This is just an amazing home! It's grand, it's unique, it's stately, it's traditional, it's one of a kind! This home is like no other. Over 8,400 sq feet, but this home will make you feel comfortable & at home. Enter into the breathtaking three story foyer and it just flows into the other rooms. The formal dining room has a chair rail and plenty of space for a large dining room set. Off this room is a large, bright family room with beamed ceilings that are such a charming feature. A gas fireplace centers the room. Off the family room is a space like no other home has. Basking in light from the window filled room, this space is currently being used as a home gym/exercise room. This space is connected by French doors to another grand room that can be used for whatever your heart desires! It is open to the rear paver patio entertaining area and the current owners use it for their parties that they hold. Imagine hosting the party of all parties in this space! It has a cozy gas fireplace, 2 story features & a beautiful laminate wood floor. The Chef's gourmet kitchen features a focal wall of custom stone work.. Cherry cabinetry, Viking appliances, a 4 person breakfast bar, built-in desk area as well. As the kitchen is a place where everyone gathers, this kitchen has space for everyone. Just a step away is the breakfast room. This bright room has french doors to the outside patio area and yard. It has a vaulted ceiling. There is a large laundry area with a back staircase to the second floor. Making this a convenient way to get the laundry done. There is also a full bath in this area. Upstairs the spacious master bedroom features vaulted ceiling, ceiling fan and a gas fireplace for the chilly evenings. The Cherry hard wood floors continue on this level. There is also a sitting room in the master. The closet space is not lacking! 2 walk in closets and 3 other closets. The master bath has custom tile flooring, Jacuzzi tub and seperate stall shower. Down the hall"
"Stunning, California-style contemporary ranch home nestled in a tranquil park-like setting. This turn-key home has been renovated and updated throughout and offers a sprawling 6,000+ SF of amazing space with gorgeous architectural details. The home boasts exquisite stonework, soaring high ceilings, an abundance of natural light, fantastic views from various rooms and 4 fireplaces that can be enjoyed from 6 different rooms, as two of the fireplace are two-way. You will also notice the elegant millwork, arched doorways, architectural columns, French doors, built-ins, hardwood floors and recessed lighting. The voluminous windows and glass doors provide a continual connection and flow from the interior spaces to the serene outdoors spaces. The 2+ acres of lush grounds include your own private pond with a waterfall, a putting green, an in-ground pool with handsome Tennessee flagstone surround; all encompassed by a brand new split rail fence. The property backs up to the June Fete Grounds consisting of 40+ acres of green space. 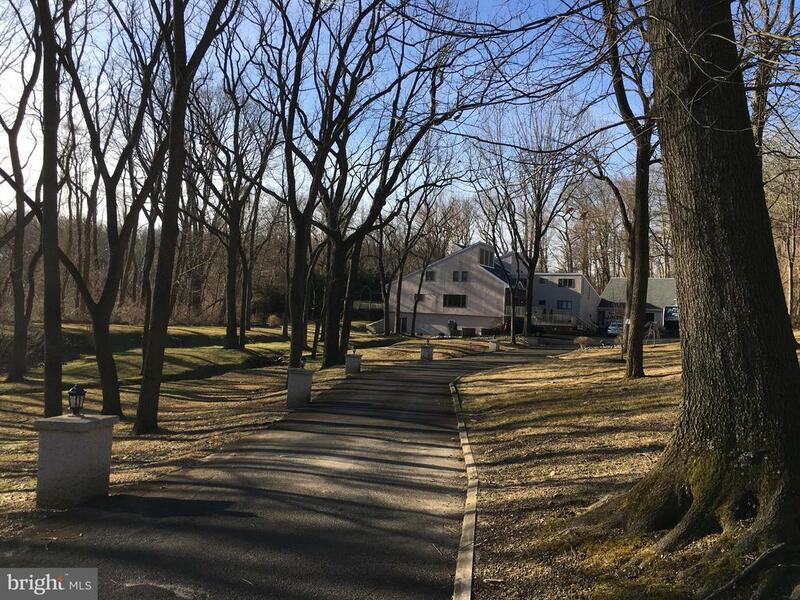 Also, walking distance to Pennypacker Trail and Bird Sanctuary which are part of the Pennypacker Trust that includes over 300 acres of natural land with 10 miles of trails. Upon entering the home you will immediately be enamored by the stone flooring and floor to ceiling stonework in the foyer. The stonework continues into a breathtaking room that boasts a floor to ceiling fireplace, a wet-bar and an expansive picture window with a built-in window seat that overlooks the pool complex. Just beyond this room there is a bedroom, walk-in closet and a full bathroom. A spiral staircase leads to a large bonus room that offers a great flex space that can be used for a variety of things such as a home office, kid study room, artist studio, music studio, craft room, etc. This wing of the house is prefect for an au pair/in-law suite or guest quarters. From the foyer you can continue to the airy living room or study with handsome built-ins. 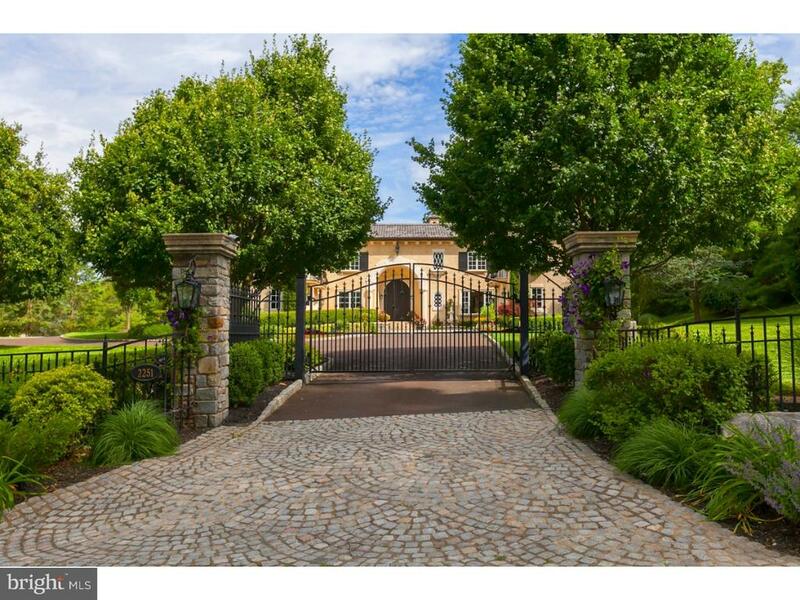 These "
"The elegance and charm of this one-of-a-kind property captures your attention as you enter the circular driveway of this French Country home. 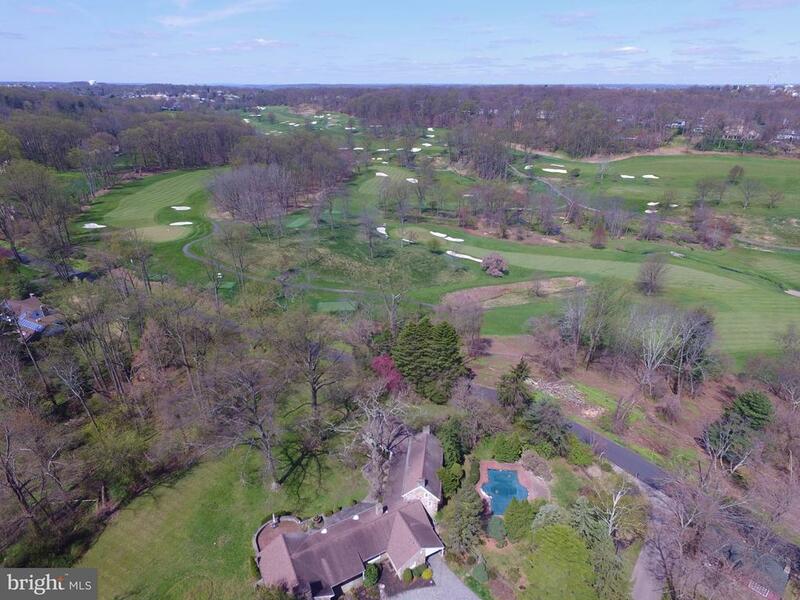 You will almost forget you are in prestigious Huntingdon Valley. The 4700+ square feet of this incredible property named Twin Chimneys was built in 1910. Warmth and symmetry combined with the allure of its timeless features and many updates make a perfect home for your modern family. Situated in the middle of a pristine flat two acres, the rear of the home is completely private with its own picturesque patio, in-ground heated swimming pool, tennis court and flawless lawn. There are five bedrooms, three and a half baths, a detached garage with possible one bedroom apartment, generously sized rooms - all with French doors leading outside. There is a sunny spacious kitchen with all the needs of any chef, and a new state-of-the-art gas heating system as well as a whole-house automatic emergency generator. Additional features include hardwood floors, radiant heated floors in the kitchen, a finished basement recreation room and storage area, 200 amp electric service, a few cedar closets, and details you will love all around. This home is unique, a true gem to see and to live in. Convenient to public transportation, all major roadways, fine shopping and dining, Twin Chimneys is in the award-winning Lower Moreland school district." 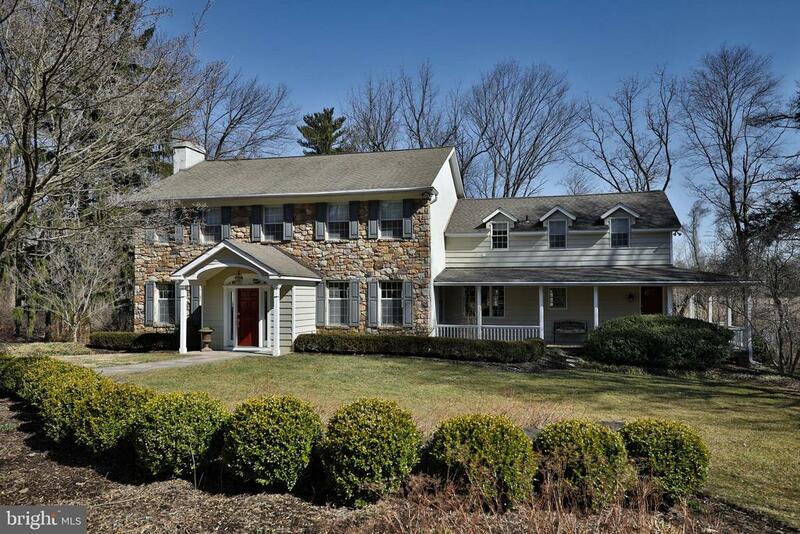 "Resting in middle of Huntingdon Valley, Pa, with 230 acres of Lorimer park is this exceptional 7900=/- sq ft warm and professionally decorated counterparty style home. The long private drive for 20+ cars will make entertaining easy, or just making it easier for you to enter your 4 cars plus garage with additional storage area. When your entering this home, it is warm and welcoming from the time you enter the 2 story foyer and entry hallways, that the whole house centers around. Architectural spiral staircase, balcony~s, windows galore to let the outside views and light in, no matter where you are located in this estate home. If you are a chef or like ordering out, the kitchen will fit you. It offers plenty of cabinetry, counter space, bar seating area for casual dining or the formal eating area that will host over a 12+ person table, sliding door to raise deck to have the feeling of sitting in a tree house in the park. The master bedroom is located on the first floor living, huge walk in closet and master suite bath, 2 story stone fireplace and exit to private outside deck area. Off the main foyer is a ~ bath, office/library and stately 2 story great room, boasting a wet bar, stone fireplace, 2 story vaulted ceilings and balcony area and exit to yes, another deck for entertaining. Located additionally on this floor is a suite with office/living room, 2 full baths, large bedroom 2nd bedroom with spiral staircase to balcony sitting area. Now that we have explored the first floor, lets see what the 2nd floor has to offer, a princess suite with a Jack and Jill bath set up, an additional bedroom area and 2 private sitting areas, this is also where you access the Balcony of the great room. If that is not enough, let~s go to the lower level that offers a full walk out to a patio area. This level offers a restaurant feel finish with 18 foot long bar, sitting and booth area, full open area used now as a celebrity style gym area, with full bath and steam showers. This"
"JUST REDUCED! NEED TO SELL BEFORE SPRING!!! MAKE US AN OFFER WE CANNOT REFUSE New Construction, 3-level home!!! Fabulous new 4-bedroom, 4.5 bath home sitting on 1.043 acres in a convenient established neighborhood, located near Holy Redeemer Hospital. Enter to a private, circular driveway leading up to the home, nestled adjacent to a pond with its lily pads and lighted fountain. Two tapered Doric columns greet you at the entrance foyer at the top of an exterior slate stone staircase, then entering into a 2-story foyer, with one of 2 custom wood & steel open stair cases front and center giving you access to the upper level. A sense of open-air and light is not lost once inside. Premium casement windows stretch up almost to the 10-0 high main level ceilings letting light pour in, engrossing the open-style floor plan and its natural oak floors creating a spacial elegance you deserve. LED lighting throughout (sconces, recess, pendants - gallery lighting in hallways) will provide years of maintenance free lighting and energy efficiency. The main level features a modern gourmet kitchen with island / bar seating, a quartz counter with a waterfall edge, Viking Professional appliances, a separate dining room with an adjacent butlers pantry, a breakfast area, an exterior 300 sq ft patio with sweeping views of the property and pond, a family/gathering room with a gas fireplace, a living room, powder room, 2 coat closets, laundry room, garage access and a study with an oversize bay window and french glass doors. The lower level consists of a modern full size bathroom with shower, wet bar/kitchen, game room, home theater space, utilities, storage and another exterior 300 sq ft patio giving you access to the yard and views of the pond. The master bedroom is situated on the upper level with a large sitting area, see-thru fireplace, custom marble and quartzite master bathroom with freestanding tub/cathedral ceiling/separate toilet room, a dressing area with makeup table, large walk"
"This is an exceptional home, custom built in a traditional brick Colonial Style, has the look and feel of a 19th Century Estate while seamlessly blending in today~s amenities. Come see the Custom trimwork, crown molding, chair rails, wainscoting, pocket doors, hardwood floors and other architectural details that adorn the rooms. A two story grand foyer with dramatic sweeping staircase is flanked by formal living room and dining room. You~ll enjoy cooking and entertaining in the newly renovated kitchen with stunning high-end features. Just off the Kitchen is the Great Room and features a 2 story brick gas fireplace and ample room for both your formal and casual entertaining. Anderson French doors open out to a concrete pad foundation ready for a future addition or outdoor living space. Also off the kitchen, is a large laundry and storage area with easy access to the back patio, the 1st of 5 bedrooms and Full Bathroom, an additional with large closets currently used as an office but could be used for a craft room, additional guest room, den or playroom. You can access your Four car garage from this area as well as the back stairway, that runs from the basement all the way up to the large walk up attic. 10~ ceilings on the first floor extends the closest upwards and provide plenty of storage. As you move upstairs you~ll find an Owner~s suite with formal sitting area, large bedroom, dressing area, oversized walk in closet and Ensuite bathroom with large soaking tub and Steamer Shower. Also on this floor you'll find another large bedroom with generous closet space and an ensuite bathroom, 2 more large bedrooms and a full hall bathroom. 3,000 sqft finished basement with brand new carpet, Full Bathroom, Gym, Bonus Room and Wine Room with racks for 340 bottle capacity and mechanical room. Fresh Paint, Updated Mechanicals, Exterior powerwashed (3/19) The list goes on and is attached with support docs and lot layout. 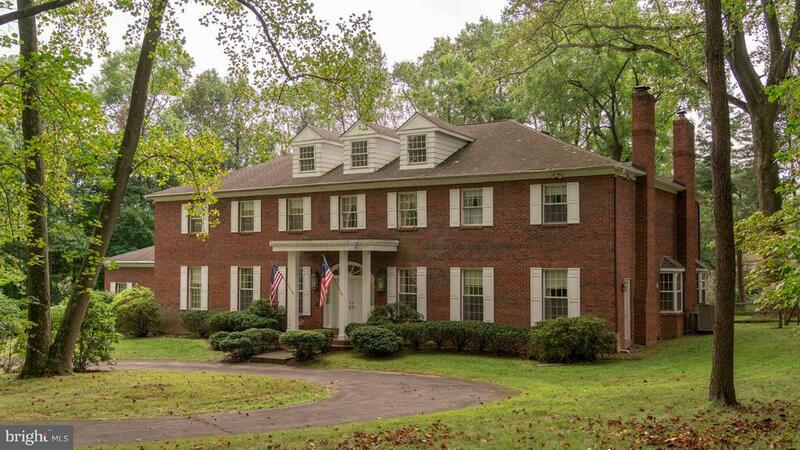 This gorgeous property has mature trees and retreat lik"
"Welcome to 345 Lamplighter in the prestigious Greenridge development in Huntingdon Valley. These owners' meticulously maintained home is waiting for you to fall in love. Enter through custom double glass pained doors into the dramatic foyer with marble floor and circular staircase. The sunk-in living room is a warm and inviting space with cathedral ceilings and custom window treatments featuring a dual stone fireplace as the focal point of the center of the home. The stunning dining room is perfect for an intimate dinner or dining on a grand scale. Off the dining room into the newly remodeled kitchen is a custom butler pantry/wet bar. Enjoy your breakfast in the large breakfast area looking out the large windows to the freshly manicured back yard. Natural sunlight fills this home. The remodeled family room with bump out, recessed lighting, and coffered ceiling is a comfy spot to gather around the fireplace. The modern kitchen with stainless appliances, granite island, custom cabinets, walk-in pantry, is a chef's dream. A first floor master-suite with a full bath with double walk in closets and beautiful built-ins is like a penthouse suite feeling. First floor Laundry, oversized mud room with access to the 2 plus car garage. The oversized garage has enough square footage to house 4 vehicles plus storage room. The garage also has built in storage which adds convenience. Upstairs is like a dream with 5 very large cozy bedrooms and a lounge area in the hallway up the circular staircase. In the princess suite it can actually dual as another master suite or in-law suite. This bedroom and attached sitting room has a large walk-in closet and full bath. Down the long hall to the other end of the second floor are the other over-sized guest rooms and full guest bath. The completely finished basement with built-in bar and wet bar is perfect for entertaining. The basement also offers, sauna, hot tub room, steam shower, movie room, work out area, lounging area and anoth"
"Fabulous opportunity! 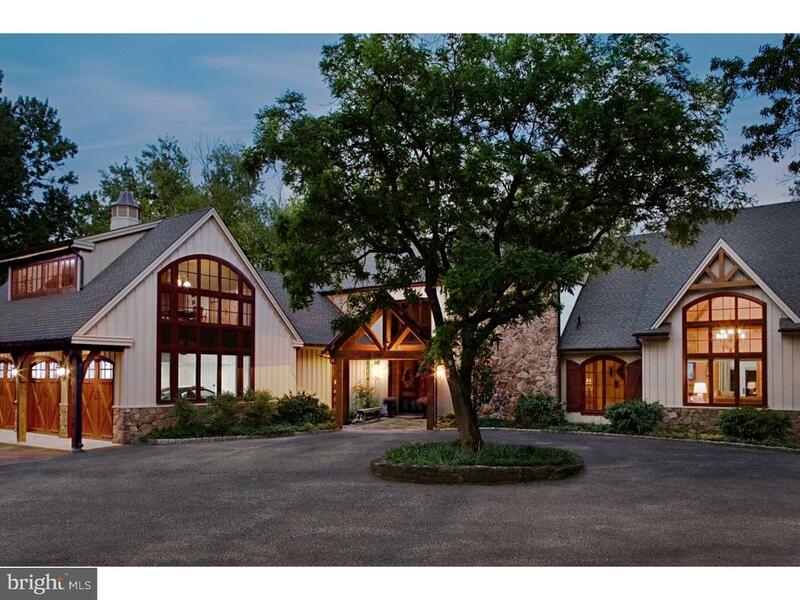 Exquisite Home, tranquilly nestled on 2.3 acres. Beautifully designed, this home offers the graciousness of quality mill-work and molding, blended with a contemporary, open, airy feeling. As one enters the two story Foyer, the gleaming wood floors, graceful staircase and attention to detail are notable. The charming Living Room features a brick fireplace and custom built-in cabinetry. A formal Dining Room leads to bright, spacious eat-in, gourmet Kitchen with huge island, abundant cabinets and skylight. The dramatic Great Room addition must be seen! It is hi-lighted by a spectacular window wall, vaulted ceiling, incredible tiled fireplace and beamed loft area. Perfect for entertaining family and friends and everyday living. There is an additional cozy Den with stone fireplace and sliders to a railed porch. The Mud Room, fitted with a special doggie bath, Sitting Room, and Powder Room complete this level. A wonderful Master Bedroom with two walls is closets and a large updated Master Bath is on the second floor. Three additional Bedrooms, two tile baths, and laundry room are also on this level. The Lower Level features a huge walk out Family Room and mirrored Ballet/Exercise Room. A bonus above the 3 car garage is a bright, open in-law suite or guest house with Living Room, Bedroom and eat-in Kitchen. The lovely, landscaped grounds feature outside living spaces including a wrap around porch, side deck, stone patio and a fire pit area. Too many details to note!! Convenient to parks, shopping, restaurants and transportation. Lower Moreland Blue Ribbon Schools. A must see! Showings start at Open House on 3/17/19." 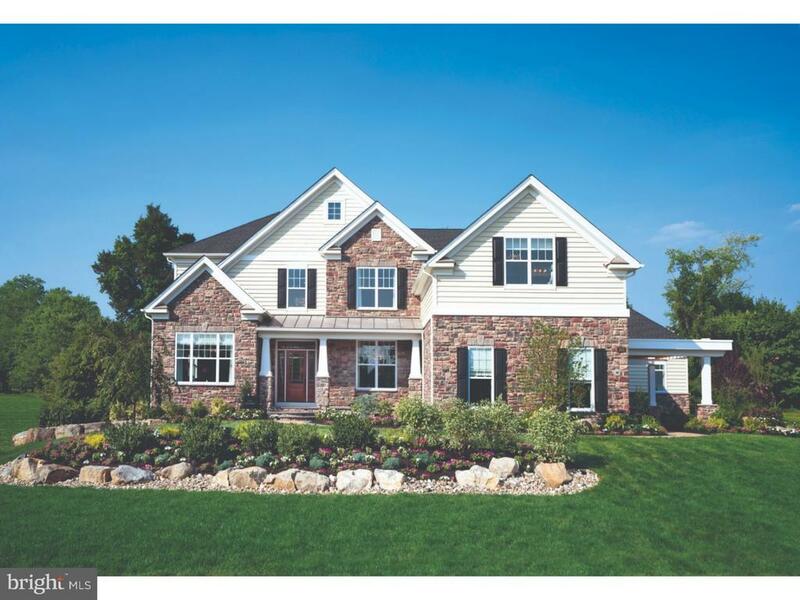 "New construction community in Huntingdon Valley! Introducing Stone Mill at Huntingdon Valley, a single-family home community in the Lower Moreland School District with modern home designs, luxurious finishes, and large home sites. This listing represents the Stansbury home design which is available to be built. Photos are used for representative purposes only. TaBring your inner chef out! The Stansbury includes a gourmet kitchen that enhances your culinary talents. It boasts generous counter space, dual sinks, an expansive island with seating, a walk-in pantry, and an adjoining breakfast area with a centrally located desk and access to the rear staircase. This home is impressive from the moment you enter the two-story foyer, which is complemented by views of a handsome curved stair. On one side of the foyer, the formal living room is perfect for casual or formal gatherings. On the other side, the dining room includes a butler's pantry for easy and elegant entertaining. The expansive family room offers a fireplace for chilly nights. The master bedroom suite features two large walk-in closets and a luxurious bath with a Roman tub with decorative columns, a separate shower, dual vanities, and a private toilet area. Additional highlights include a playroom or optional fifth bedroom, and nine-foot ceilings throughout. Taxes to be determined. Please see Sales Manager for details." "This home boosts over 5,550 Sq feet. Fully renovated 5 bedroom 3 full and 2 half bath home with new additions of a first-floor in-law suite (or can be your first-floor master), sun-room, 2 car garage, deck and an additional finished area in the basement completely move in ready. Kitchen is featuring high-end SS appliances, including a sub-zero refrigerator, beautiful granite counter tops, and large kitchen island with room for seating. The breakfast area has sliders leading out to the new rear deck. The family room has a gas fireplace and doors to the new window-filled sun-room with its own heating/ac system with access to the outside deck. Both the large dining room and living room have newer Brazilian cherry hardwood floors. The newly added 1st floor master suite has a full bath with walk-in shower that is also a sauna/steam spa and a large walk-in closet. Located just across the hall is brand-new second kitchen. This can be used as part of the in-law suite or as a second kitchen for the main living portion of the home. Also there is a full laundry room with cabinetry and a half bath. On the second level is another master bedroom suite. The bath is spa-like and thought was put into every detail. There is a river-rock bottom, glass enclosed shower with multiple shower heads, a Jacuzzi tub, towel warmer and more. Also, in this suite, find a separate makeup vanity and walk-in custom closet with center island and 2 other separate closets along with a sitting room and doors to a balcony for your morning coffee. The other 3 bedrooms have walk-in closets and one has double closet. The finished basement has lots of extra living space including an open family room area, half bath, bar, dance floor, and newly finished room for an office or work out room. This home sits on a half-acre lot that has been professionally landscaped at the end of the cul-de-sac. A newly installed iron fence along with a gated drive way, a new over-sized 2 car garage, new roof, whole house generat"
"New construction community in Huntingdon Valley! 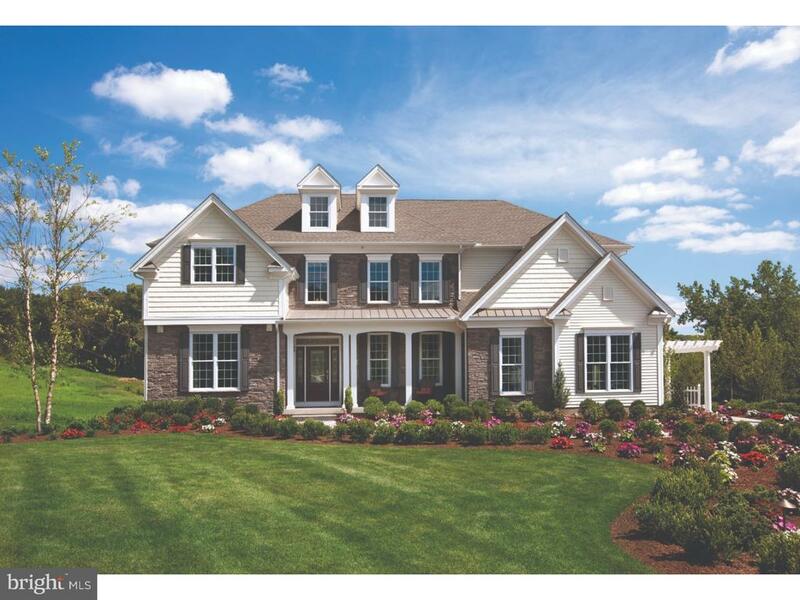 Introducing Stone Mill at Huntingdon Valley, a single-family home community in the Lower Moreland School District with modern home designs, luxurious finishes, and large home sites. This listing represents the Duke home design which is available to be built. The Duke provides a grand setting for cooking and entertaining, featuring a spacious kitchen designed with the chef in mind. And after a night hosting friends and family, this home offers luxurious respite in its master bedroom, which includes a private den and a dedicated dressing area. Once you enter through the two-story foyer, which is flanked on one side by a living room and on the other by a dining room, this gracious floorplan leads you to an expansive family room. Adjacent to the family room is a private study. Upstairs, the lush master bedroom suite includes a spacious master den and an indulgent master bath with a cathedral ceiling, a Roman tub, a separate shower, and a private dressing area. Photos are used for representative purposes only. Taxes to be determined. Please see Sales Manager for details." 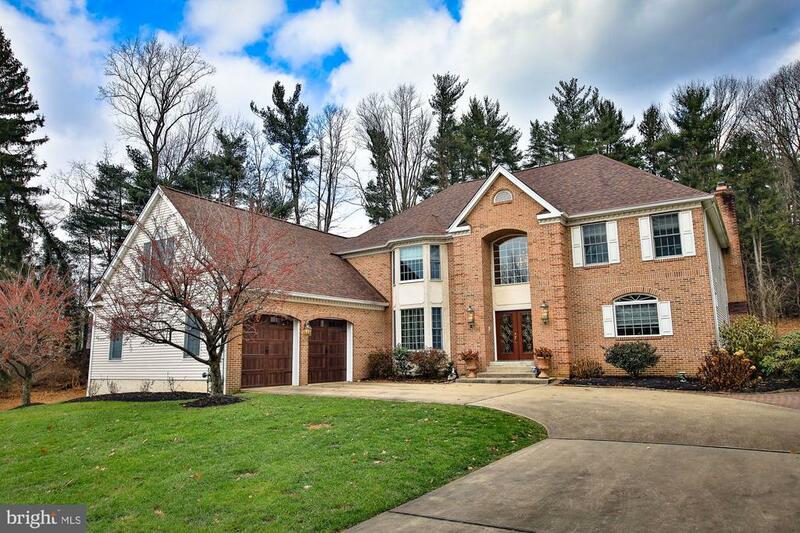 "You won't be disappointed with with the absolutely magnificent custom built 4 bedroom, 2 full and 2 1/2 baths contemporary home on 1.12 beautifully landscaped acres located in the very desirable & prestigious Lower Moreland school district. Enter this lovely home through etched glass double doors into the 2 story foyer with etched palladium window, hardwood floors, 2 coat closets and custom light fixture. On the first floor you will also find: living room with hardwood floors and recessed lights; dining room with hardwood floors, custom light fixture and recessed lights; gorgeous recently remodeled custom kitchen with hardwood floors, high-end stainless steel appliances, granite counter tops, custom cabinets with stainless accented crown molding, large island with huge rectangular sink, glass top, seating & custom light fixture, coffee bar, bar area, large built-in banquette with granite topped table and sliding glass doors to a beautiful deck with built-in hot tub, perfect for your summer get-togethers; family room with vaulted ceiling, sky lights, wood-burning fireplace, custom built-in, ceiling fan and sliding glass door to your deck; office/bonus room; convenient first floor laundry/mud room with utility sink and 1/2 bath and door to the driveway. Second floor: turned stairs to an open hallway with glass enclosed railing, overlooking the foyer and family room; large master bedroom with vaulted ceilings, recessed lights and huge professionally organized walk-in closet; master bath with double sinks, vanity area and stall shower; 2nd bedroom with charming window seat, recessed lights and professionally organized closet, spacious 3rd and 4th bedrooms with professionally organized closets; hall bath with double vanity sink and tub/shower. Additional features; huge fully finished basement with temperature controlled wine cellar, 1/2 bath and multiple storage closets; 2 zoned central AC and gas heat, alarm system, surround sound, lawn sprinklers, whole house stand-b"
"Welcome to the Stunning 4 bedrooms 4 1/2 baths home in the desirable Estates at Huntingdon. This is the biggest model in the development w/ almost 6000 sq.ft. including finished basement. This beauty have so much to offer. Enter the house into Grand two story foyer with marble fl, view of the gorgeous wooded staircase, first floor also features formal LR/DR w/upgraded moldings, Office/den, beautiful hardwood floor through out, Family room two story ceiling w/ wall of windows and gas frpl, upgraded gourmet kitchen w/ 42 Cherry Cabinetry and Granite countertop, double oven, breakfast room, 2nd kitchen with commercial range and hood, laundry rm with access to 2 car garage. 2nd Floor features a huge Master suite w/ tray ceiling, 1 huge walk-in closet, sitting area and full master bath w/ 2 separate vanities, tile shower, and Jacuzzi tub, 2nd bedrm is an in-law suite w/ full bath, 2 more nice sized bedrm, hall bath, the hallway over looking the familyrm. Also features a full finished basement w/ a full bath, great to game rm, Deck, recess lightings, 2 zone Heat/Ac and more importantly in the Award Winning Lower Moreland School district. This one is A Must See!!!" 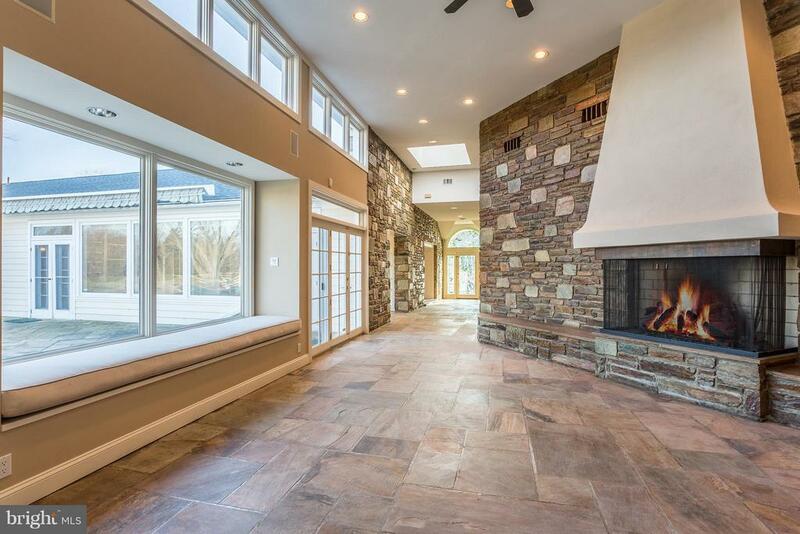 "Welcome to Huntingdon Valley, where you can live in this immaculate 5 Bedroom Contemporary home including 3.5 Baths spread over 5500 Sq Ft of warm & inviting Living Space! Lower Moreland High School ranked as of one of Newsweek Magazines Top US High Schools and the 6thbest High School in Pennsylvania in 2018.Convenient to Train, Turnpike, 95 and Center City. Truly Move-In ready for that Upscale Buyer who wants it all! Gracious large entry foyer that captures a beautiful view from every window with the luxury of privacy throughout. Open Dining Rm can be used for informal dining or hosting large dinner parties! This Spectacular Kitchen offers every upgrade a Gourmet Cook could want! Extra Large Wood Cabinets, Granite Counter Tops, Spacious Pantry, Double Sink & additional Island w/separate cooktop! Appliances include Subzero Refrigerator, Thermador Double Convection Oven, Fisher Paykel Double Drawer Dishwasher & Microwave Oven. Accented by Recessed Lighting, Pendant Lighting & ceramic tile floor. The kitchen flows into a covered deck area that's perfect for your morning coffee or entertaining. Overlooking your very own Fenced in Tennis Court! Spend quiet time in the truly Great Room w/soaring ceilings, heated granite floors and a gas fireplace! Step into your outside Oasis through Pella sliding doors w/built in shades. The First Floor includes Laundry Room, Office, Powder Rm & interior access to 2 Car Garage. Travel to the second floor on a dramatic winding wooden staircase that overlooks the first floor Great Room and the second floor Sunlit stained glass landing area that provide privacy for every bedroom. Your Master Suite has it all! Expansive Bedroom with sitting area, skylights featuring electric closures, large walk in closets w/California Style Closet Organizers, spiral staircase perfect for an office, sitting room or workout area. Master Bath boasts a Jacuzzi Tub, Large Shower with Glass Doors, Groehe Body Bar Shower System featuring body sprays and handheld "